U.S. retail sales rose 0.9% in December, the strongest pace in five months, to $369.9 billion. driven by strong 3% jump in electronic gadget sales, according to the Commerce Department. The increase was better than the 0.7% advance that economists had forecast. 3% jump in sales at electronics and appliance stores, which followed an even bigger 5.8% surge in November, led by the introduction of popular video game consoles - Sony's Playstation 3 and Nintendo's Wii. Sales were up 3.8% at gasoline stations, reflecting in part higher pump prices during the month. Auto sales rose by 0.3% after having been flat in November. Excluding the volatile gasoline and auto sectors, retail sales would have risen by 0.7% in December, the best showing since January 2006. Sales at department stores and other general merchandise stores rose by 0.9% while sales at specialty clothing stores were up 0.6%. However, sales at hardware stores fell by 1.1%, reflecting the continued troubles in the once-booming housing industry. 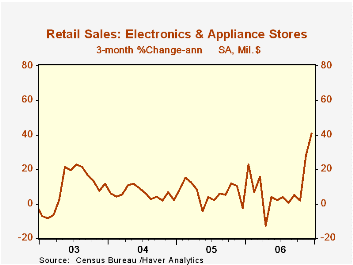 For all of 2006, retail sales rose by a strong 6%, but down from a 6.9% increase in 2005. Total sales for the October through December 2006 period were up 4.9% from the same period a year ago. Electronics and appliance stores were up 15.0% from December 2005 and sales of health and personal care stores were up 10.2% from last year. Consumer spending is closely watched because it accounts for two-thirds of total economic activity. The strength in consumer spending in the final three months of the year may push overall 2006 GDP growth up to an annual rate of 3% or better.